These make for a drop-dead easy and flexible accompaniment / side dish. Simply lube up the little darlings in a splash of flavoured oil, hoy them into a hot oven, and forget about them until the timer rings. This gives you more time to concentrate on your starter, main course, and dessert, safe in the knowledge that your guests won’t be bad-mouthing your choice of side dish in their cab during the ride home. This version works very well with an Indian curry, as an alternative to or support act for cauliflower rice, but you can obviously tailor the flavouring of the oil to whatever main course you are preparing. 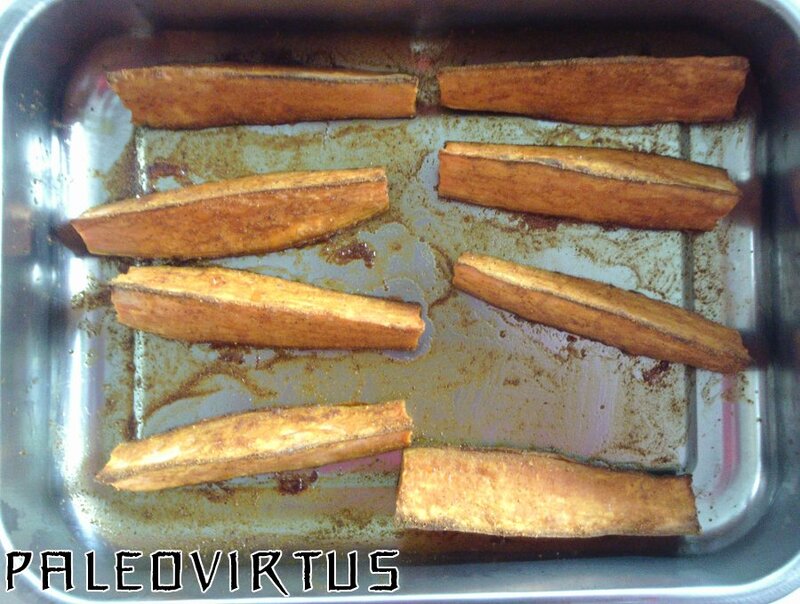 Pre-heat the oven to 200 ° C.
Cut the sweet potato into wedges, each one being ⅛ the size of the whole beastie. Mix the oil and curry powder well, to form a thin, oily, paste. Brush the bottom of a small roasting pan and each individual wedge with a little oil. Place in the oven, and roast for about 45-50 minutes, until the wedges have a nice colour, a somewhat crispy exterior, and a soft, fluffy interior. This entry was posted in Food Diary, Recipes and tagged curry, Indian, paleo, recipe, roast, side dish, sweet potato on October 15, 2014 by paleovirtus.